Each new release is composed of 15.87 grams of 99.99% pure silver. 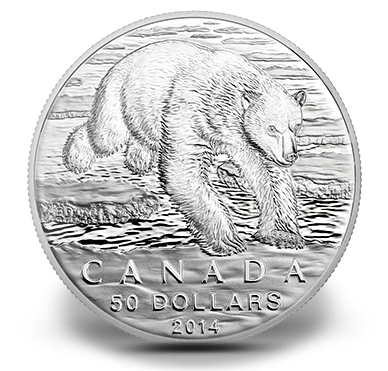 Shown on the reverse is the likeness of a single polar bear shown in its natural habitat. The design, by Canadian artist Emily Damstra, offers the bear in what appears to be an ice flow as it moves from a floating chunk to land. Inscriptions on the design include CANADA, 50 DOLLARS and 2014. As mentioned, the release is the inaugural strike of a new 'Exchange $50 for $50' series. Under the terms of the program, each $50 legal tender face value coin may be purchased for $50. The Royal Canadian Mint has had extreme success with two similar programs - the 'Exchange $20 for $20' series which debuted in 2012 and the 'Exchange $100 for $100' program which followed in 2013. Both previous programs have proven popular with collectors leading to sell-outs of all but the most recent two $20 program issues. For reference, those two $20 coins in the associated programs include the $20 Canada Goose Silver Coin and the $20 Bobcat Silver Coin. 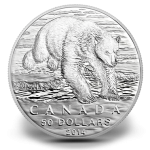 Orders and additional information for the new 2014 $50 Polar Bear Silver Coin may be found on the Royal Canadian Mint's website of www.mint.ca or by calling 1-800-267-1871 (Canada), 1-800-268-6468 (US) or 613-954-2626 (International).